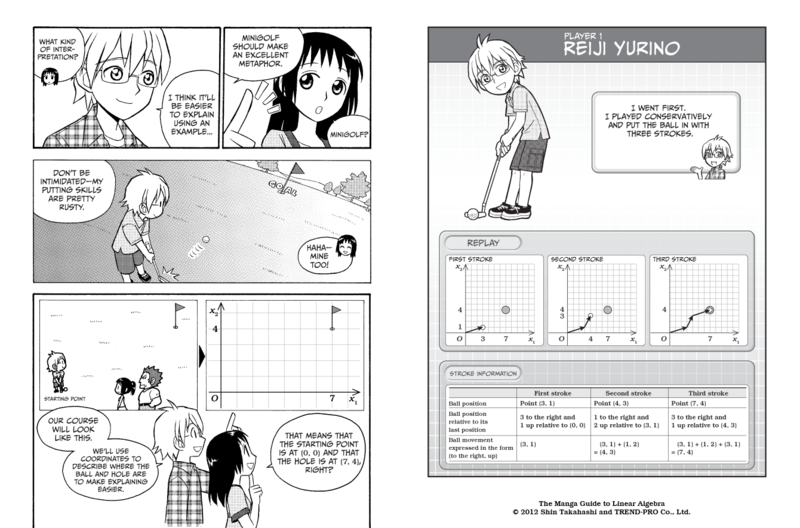 San Francisco, CA, May 23, 2012—With acclaimed titles like The Manga Guide to Physics and The Manga Guide to Calculus, the best-selling Manga Guide series from No Starch Press is changing the way students think about math and science. By combining real mathematical content with authentic Japanese manga, the Manga Guides take the sting out of learning complex topics. The latest in the series, The Manga Guide to Linear Algebra (No Starch Press, May 2012, 264 pp., $24.95, ISBN 9781593274139), helps math and computer science students wrap their brains around a tricky required course—linear algebra. The book uses the story of a university student and her tutor (a wannabe karate champ) to keep readers engaged while they learn the fundamental concepts of linear algebra. "The Manga Guides work," says No Starch Press founder Bill Pollock. "One mother told me that her daughter with dyslexia improved her Physics grade from a C to an A, all due to The Manga Guide to Physics. It's gratifying to give students that leg up, and we're pleased to continue offering more Manga Guides to our readers." For more information or to request a review copy of The Manga Guide to Linear Algebra, contact Jessica Miller at No Starch Press ([email protected], +1.415.863.9900, x110) or visit www.nostarch.com. Shin Takahashi was born in 1972 in Niigata. He received a master's degree from Kyushu Institute of Design (known as Kyushu University today). Having previously worked both as an analyst and as a seminar leader, he is now an author specializing in technical literature. Trend-Pro Co., Ltd. is a pioneer of Ad-Manga—advertising using Manga—in Japan. The company has produced over 1,700 Ad-Manga for over 700 clients, including many well-known public companies and government agencies. The company has over 100 registered professional Manga artists. Each volume in the Manga Guide series explains essential scientific and technical subjects using Japanese-style comics. Co-published with Ohmsha, Ltd. of Tokyo, Japan, each guide is written by a scientist or mathematician with expertise in the field and illustrated by a professional manga artist and scenario writer, ensuring the authenticity and accuracy readers demand. Bestsellers in their original Japanese, these unique books are translated into English with the assistance and oversight of technical experts. Titles in the series include The Manga Guide to Statistics (9781593271893), Databases (9781593271909), Electricity (9781593271978) Physics (9781593271961), Calculus (9781593271947), Molecular Biology (9781593272029), Relativity (9781593272722), the Universe (9781593272678), and Biochemistry (9781593272760). Founded in 1914, Ohmsha is a science and engineering book publisher based in Tokyo, Japan. In addition to publishing dozens of titles a year in Japan, Ohmsha is also active in foreign projects, including co-publications with major publishers in Europe, North America, and Asia, and joint ventures with major international publishers. With the aim of contributing to the development and progress of science and technology in Japan, Ohmsha established The Promotion Foundation for Electrical Science and Engineering in 1951. Through this foundation, the OHM Technology Award is given every year to those who have made significant contributions to the field of electrical engineering.